So it was Wednesday morning. I crawled out of bed, and was struck by how cool it was in my apartment. I had known it would be one of our first chilly days of the season, and instantly I just had this undeniable urge to bake. And cookies for the Fall seemed like the perfect way to counteract the chill in the air. And I couldn’t get these Pumpkin Chocolate Chip Oatmeal Cookies that I saw on Pinterest out of my head. 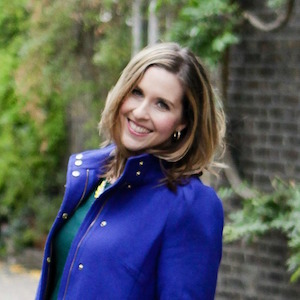 I recently watched an interview with Gabby Bernstein. In it she talked about one unknown fact about her, which is how passionate she is about cooking. In fact, she said something that I wholeheartedly believe: That cooking is an art in its meditation. Oh preach, Gabby! Such a deep and beautiful statement. Yes, to me when I’m stressed I bake. When I’m happy or want to go to my happy place, I’m in the kitchen cooking or baking. And lately, I’ll be honest, life is stressful. It’s hard for me to shut off my brain as it’s on a constant hunt all day of things to think about. Work has been particularly stressful as I’ve become a bit of a one-woman show in my department. That can wear a girl out, let me tell ya. So there was no time more perfect for me to cook. I’d never thought about it as a meditation until Gabby said that, but it really is. Cooking and baking is how I quiet my overactive brain. It saves me over and over. Naturally then I felt called to bake today. Thanks to the stress and the Fall weather, it was inevitable. I was pretty excited too. I hadn’t used my Kitchen Aid in a while, and she was feeling ignored. 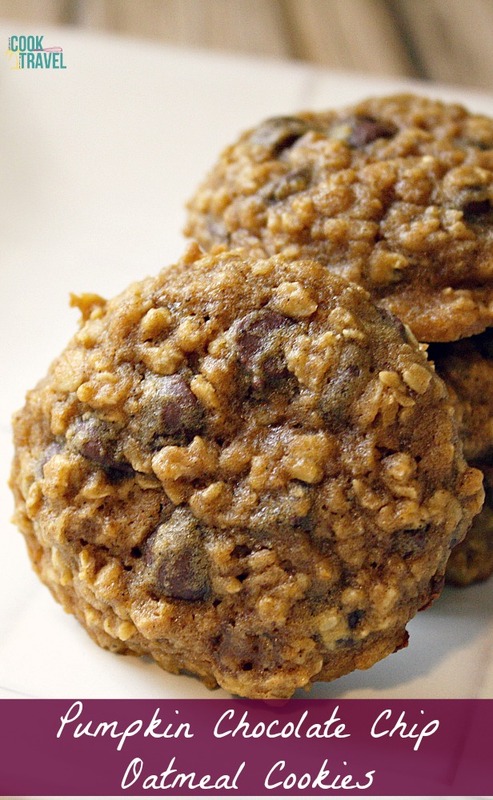 The cookie dough for these Pumpkin Chocolate Chip Oatmeal Cookies is pretty standard. You cream your butter and brown sugar together, add eggs in, followed by pumpkin puree and vanilla. Then you mix your dry ingredients together (flour, quick oats, salt, baking powder, baking soda, nutmeg, cinnamon, and cloves). Those spices . . . sigh. Just measuring them got me all excited for Fall. Suddenly I wanted to run to a coffee shop and grab a fancy latte. Or better yet. . .apple cider sounds amazing! The flour combines with the dough, and then you’ll fold in the chocolate chips. Form the cookies and bake for 10-12 minutes and let the cookies cool. Super simple, and totally hit the spot. 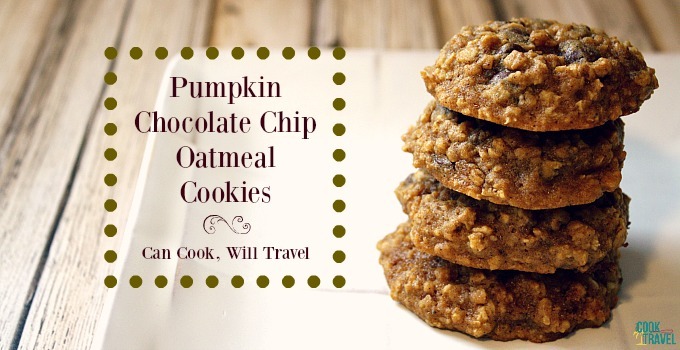 I loved how quick the Pumpkin Chocolate Chip Oatmeal Cookies come together. And you’ll love how fabulous your kitchen smells as they bake and are cooling on the counter. First off, it smells like Fall. You have the warmth of the spices that say a subtle “hello”. And then you get a hint of chocolate as you breathe them in, which is always a good thing in my book! When it comes to the taste, they are super soft and chewy. You definitely don’t want to overwork the dough or bake them too long. These cookies melt in your mouth, and in addition the oatmeal gives a nice bite to each cookie. And while I love pumpkin, I don’t like my food too pumpkin-y. You know, sometimes food can be like that and these cookies aren’t overly pumpkin tasting. The pumpkin ends up adding a nice, soft texture and helps bring out the spices even more. So yeah, these are kinda the perfect cookies for Fall. 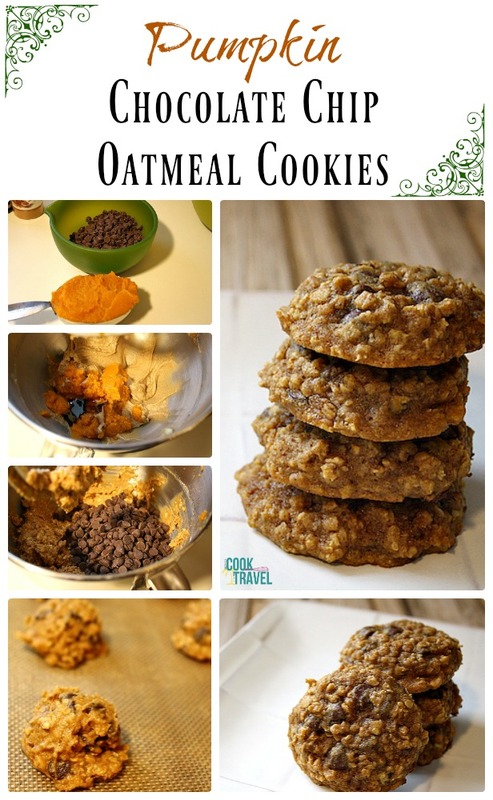 And I can’t wait for you to whip up a batch of Pumpkin Chocolate Chip Oatmeal Cookies for yourself. So what are you waiting for?? Go ahead and click that link to get the recipe and step by step instructions. Happy cookie eating! One year ago: Earl Grey Scones with Lemon Icing – Cheerio, Love! Four years ago: Sinfully Good Dip!